Director/Screenplay – Eugene Lourie, Producer – David Diamond, Photography (b&w) – Ken Hodges, Music – Edwin Astley, Special Effects – Irving Block, Louis De Witt, Willis O’Brien, Pete Petterson & Jack Rabin, Makeup – Jimmy Evans, Art Direction – Harry White. Production Company – Artists Alliance. Scientists from England’s Atomic Energy Commission investigate reports of dead fish washing up on the Cornwall coast. They find that the fish are radioactive and that locals have radiation burns, as well as hear reports of a monster. They realise they are dealing with a dinosaur that has been revived by atomic radiation. They try to find a means of stopping the behemoth as it heads towards London, destroying all in its path. Former art director Eugene Lourie made his directorial debut with The Beast from 20,000 Fathoms (1953). The Beast from 20,000 Fathoms was a landmark film for several reasons. The most important of these was that it created the atomic monster movie, a genre that was only rivalled by alien invader cinema as the most prevalent theme of 1950s science-fiction and invariably featured either revived dinosaurs or enlarged bugs, usually created through atomic radiation. Following The Beast from 20,000 Fathoms, Eugene Lourie went on to make two other revived dinosaur films – The Giant Behemoth (called Behemoth the Sea Monster in England) and Gorgo (1961), as well as one further science-fiction film The Colossus of New York (1958). With The Giant Behemoth, Eugene Lourie also wrote the script – the only occasion he would do so on any of his films. Alas, all that Lourie has done is gone back and rehashed The Beast from 20,000 Fathoms. The location switches from the USA to the UK, with The Thames substituting for Coney Island. Aside from that, The Giant Behemoth follows The Beast from 20,000 Fathoms in every essential other point, even down to the climax featuring the killing of the dinosaur by shooting a radioactive projectile into its body. Lourie shoots on location in Cornwall and London. He is reasonably effective at drawing British stiff upper-lip figures and provincial types. The film though fails to work. The characters are one-dimensional. Almost none of them emerge to the forefront of the story as distinct heroes – they are all indistinct plot functionaries. In another film, (The Beast from 20,000 Fathoms being a good example) the character of Jean Trevarthen would become the love interest but here nothing happens. Lourie’s direction is mostly pedestrian. 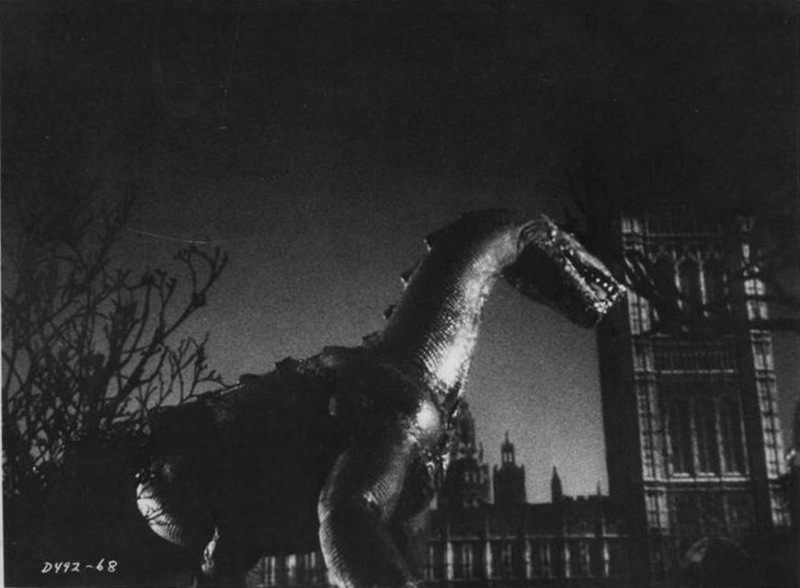 Sometimes he is capable of delivering scenes that offer effective mood – the lighthouse scene and the Coney Island climax in Beast or the climactic rampage of the mother dinosaur through London in Gorgo being good examples. However, few of the scenes stand out here, apart from one with the scientists examining a fish whose radioactivity only becomes apparent when the lights are turned out and it is found glowing in the dark. Lourie creates the dinosaur through stop motion animation – The Giant Behemoth being one of the few 1950s films that went to these lengths rather than took cheaper short cuts such as using optically enlarged bugs/lizards or men in rubber suits. To this extent, Lourie has brought on board the great Willis O’Brien who was arguably the finest stop motion animator in the world, having created the all-time classic King Kong (1933). Alas, Lourie was working with a diminished budget and Willis O’Brien was getting on in years (he was 72 at the time) and his health was in such a poor state he could only oversee the work of others. The resulting animation is shabby and cheap. The film was the penultimate work of Willis O’Brien’s career before he died in 1962 and an ignominious way for him to be remembered.